Backers of Proposition 32 have argued repeatedly that the November ballot measure will reduce the influence of both corporations and unions in politics. Unions, however, have contended that Prop 32 will actually increase the power of corporations and wealthy contributors in California, because those donors will still be able to spend huge amounts of money, funding so-called Super PACs. A massive donation made last Friday to a new group that is backing Prop 32 proves that unions are right. The $4 million donation came from the American Future Fund, a shadowy organization with close ties to the billionaire Koch Brothers. 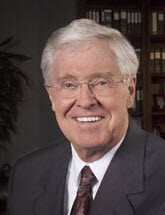 For the uninitiated, the ultra-conservative David and Charles Koch made their fortunes in natural gas and oil, and have not only bankrolled the national Tea Party movement and right-wing political candidates over the past few years, but also have been poured hundreds of millions into anti-union efforts throughout the nation. As such, the $4 million contribution in support of Prop 32 offers concrete proof that the Koch brothers-linked group believes the ballot measure will severely damage the influence of labor in California politics — while doing little to infringe on the power of large corporations and wealthy donors. The American Future Fund made the donation to a new Super PAC established to help pass Prop 32, called California Future Fund for Free Markets. The American Future Fund, itself, is a so-called dark-money group that does not have to reveal its funders before the election because it’s a nonprofit. These secret groups, most of which are backed by right-wing organizations, have been spending tens of millions of dollars this year on elections throughout the country, trying to elect Republicans and defeat President Barack Obama. The $4 million donation from the Koch Brothers-linked group also is evidence that it must be concerned that voters are now seeing Prop 32 for what it is — a sham. Just before the big donation was recorded with the California Secretary of State’s Office, a new Pepperdine University poll revealed that support for the measure among state voters has dropped to 53 percent. Numerous good-government groups, including the League of Women Voters and California Common Cause, also oppose prop 32. So why do big corporations support Prop 32? For starters, it would still allow them to influence elections and political candidates through massive contributions to Super PACS and dark-money groups. Prop 32 also would effectively strip unions of the ability to influence elections by making it next-to-impossible to raise and spend funds for political causes. As a result, even though Prop 32 also would allow unions to still fund Super PACS and dark-money groups, unions likely wouldn’t have the money to do so because of how Prop 32 is worded.